A contribution to the anatomy of the elephant's ear. Journal : Transactions of the American Otological Society ; vol. iv. New Bedford : Mercury Publishing Co., 1888. Description : 240-253 p. ; ill.: 4 photos. in-text ; 23 cm. 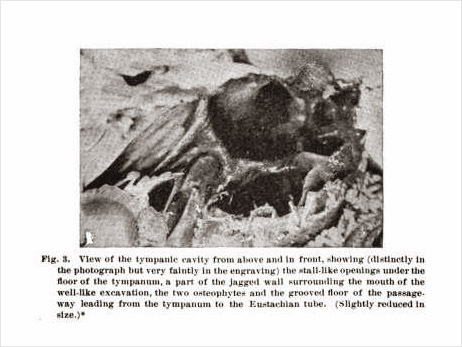 Photographs : 4 halftone photographs of specimens. Subject : Ear — Morphology. Author caption: By Albert H. Buck, M. D., New York, N. Y. Revised: Buck (1890), A revised description of the anatomy of the elephant's ear. Tr. Am. Otol. Soc., vol. iv (pp. 574-586). Revised text with photographs Fig. 1 and Fig. 4 correctly oriented. Offprint of the revised text also issued. 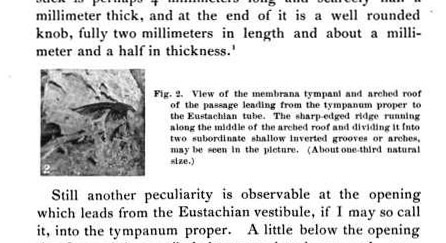 Cited: Richards, H. (1890), A further report on the anatomy of the elephant's ear. Tr. Am. Otol. Soc., vol. iv (pp. 587-604). Index Medicus: 20406711090, 30500671050, 20208871300 (offprint), 20408411050 (revised text), 20208871330 (offprint of revised text). The difficulties encountered in photographing the middle ear from different points of view were found to be very great, and as a consequence the half-tone pictures which accompany this article leave very much to be desired in the way of clear definition. — Footnote to page 247. The discovery made by Dr. Richards,[op. cit. supra] that the plane of section, which I had taken to be a horizontal plane, was in reality vertical, renders a large part of the description which I published in the Transactions of 1888 inaccurate. The restrictions under which I was placed by Prof. Wilder, who desired to preserve the specimen in as perfect a condition as possible for the Cornell Museum of Anatomy, rendered it an easy matter to be misled in regard to the true relations of these different sawed surfaces, to a vertical antero-posterior and a vertical transverse plane, and this must serve as my apology for the error which I was so unfortunate as to make. Thanks to the removal of these restrictions at a later date by Prof. Wilder, my colleague has been enabled to study the specimen more thoroughly than I could, and he has determined accurately the relations of these different parts. With the Society's permission, therefore, I submit herewith, for publication in this year's volume of the Transactions, a corrected version of the account which was printed year before last. — From the revised text, page 574. In the corrected text, Fig. 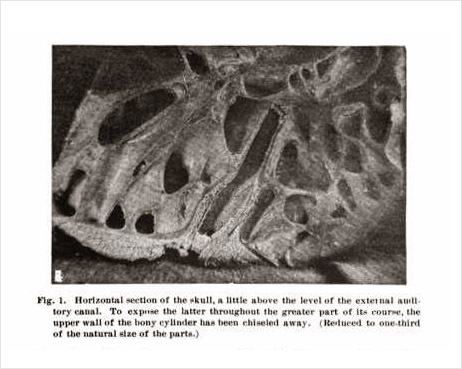 1. was rotated 90 degrees and the caption revised from "Horizontal section of the skull," to, "Vertical transverse section section of the skull." Fig. 2. was also rotated 90 degrees and its caption revised insignificantly. Fig. 3. was not rotated, but its caption was revised from "View of the tympanic cavity from above and in front," to "View of the tympanic cavity from within." Fig. 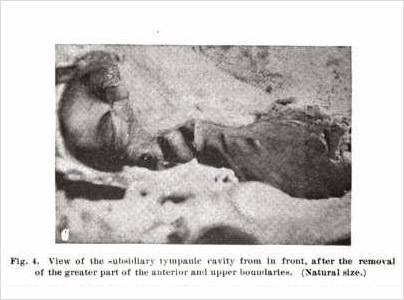 4. was rotated 90 degrees and its caption revised from, "View of the subsidiary tympanic cavity from in front," to "View of the subsidiary tympanic cavity as seen from within and behind." Doctor Buck blamed these rather embarrassing errors on restrictions applied by Professor Burt G. Wilder of the Cornell Museum of Anatomy. The specimen was sawed from the skull of Alice, mate of the circus elephant Jumbo.